In carotid artery imaging, blood suppression improves vessel wall delineation. Blood nulling post contrast may be achieved by double IR  or quadruple IR . These methods work with 2DTSE and have limited anatomical coverage. We propose a T1 weighted 3DTSE technique (aka SPACE) that suppresses blood both pre- and post-contrast in about 5.5 min. The isotropic 3D images and their T1 contrast may help identify lipid core in atherosclerotic plaque . Develop a T1w 3DTSE sequence that suppresses blood pre- and post-contrast, and compare it to contrast-enhanced MRA (ceMRA) in patients with carotid artery atherosclerosis. SPACE improves 3DTSE sampling efficiency by using variable flip angle nonselective refocusing pulses . Strong gradient lobes are applied on both sides of the readout gradients, suppressing flowing blood but not stationary tissues. The variable flip angle pulses disrupt the even-echo rephrasing mechanism and further dephases flowing spins. T1 contrast is achieved by centric reordering and appropriate design of the flip angle series. Coronal imaging maximizes dephasing effects of flowing spins . Imaging parameters for T1w SPACE were: TR = 650–700 ms; TE = 21–28 ms; ETL = 25–33; 64 partitions; parallel imaging rate 2; voxel dimension = 0.8 mm isotropic; NEX = 2; scan time = 5.5 min. Contrast-enhanced MRA images have a spatial resolution of 0.92 × 0.83 × 0.85 mm3. No triggering was used. As part of an IRB-approved protocol, imaging was performed in 5 patients with carotid artery stenosis > 50% in at least one vessel based on duplex ultrasonography. The studies were done on a 1.5 T MRI system (Magnetom Avanto, Siemens, Erlangen, Germany) using carotid phased array coils (Machnet, Netherlands). T2w SPACE  and T1w SPACE (T1pre) images were first acquired. Contrast-enhanced MRA was performed during Gd contrast injection (single dose, Multihance, Bracco). T1w SPACE post-contrast (T1post) was performed after ~3–5 minutes. Standard 3D MPR software was used to measure the vessel lumen in T1pre, T1post and ceMRA images. In each patient, luminal measurements from two arteries were made from several locations below and above the bifurcation of one of the carotid arteries on all T1pre, T1post and ceMRA images. 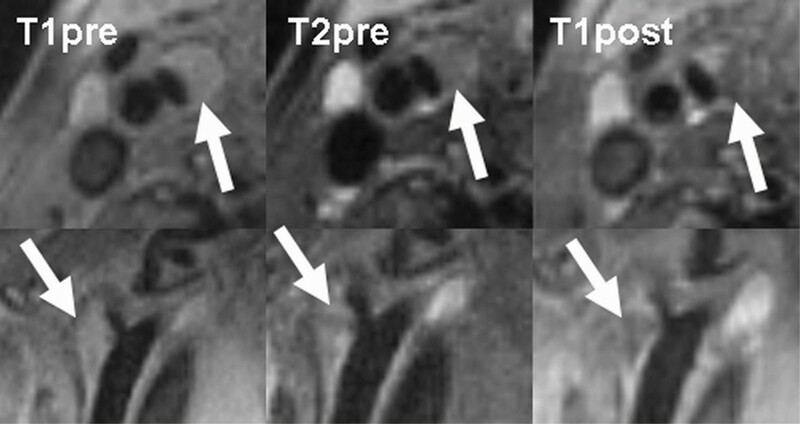 The plaque morphology from T1pre, T1post and T2w SPACE were visually compared using standard visualization tools. Image acquisition was successful in all patients. Blood was well-nulled both pre and post-contrast. The correlations among T1pre, T1post and ceMRA, together with the slopes when fitting two out of three measurements linearly were tabulated in Table 1. Plaque morphology seen from the three 3D datasets were very similar. Figure 1 showed how T1w SPACE luminal measurements are related to ceMRA. Figure 2 showed a typical multicontrast image set from one patient. Lower signal intensity in the plaque in T1post may suggest the presence of lipid core . 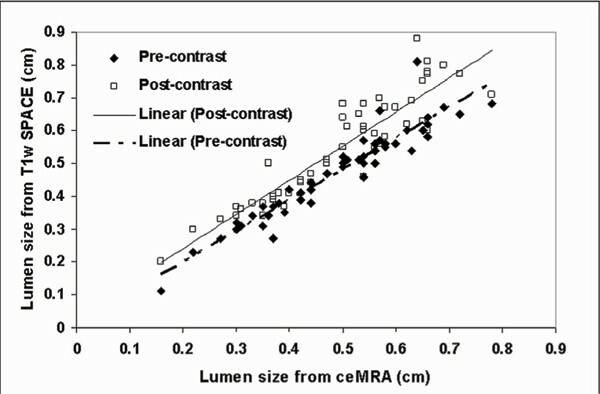 Luminal measurements from T1w SPACE pre-amd post-contrast compared to ceMRA. 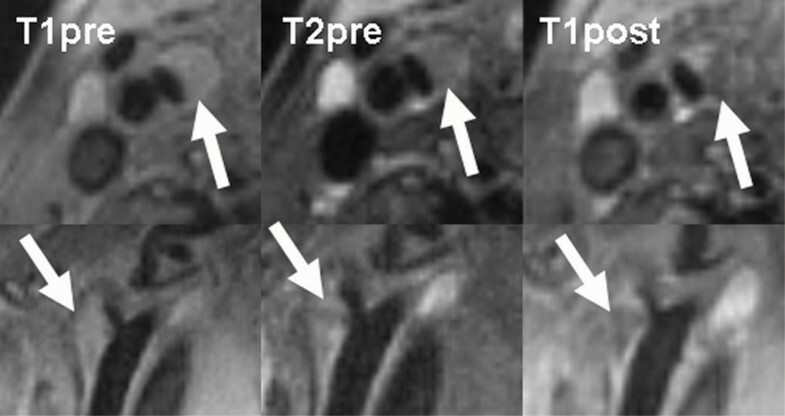 Multicontrast 3D images of a plaque pre- and post-contrast showing reduced signal intensity in post-contrast T1w SPACE, suggestive of a lipid core. We have shown that T1 independent flow suppression is possible with T1w SPACE. Previous studies required triggering for optimal blood suppression. In patients, luminal stenosis induces high peak systolic velocities  and may improve flow suppression without the need for triggering. The slightly underestimated lumen size from the images pre and post contrast may result from blurring due to centric reordering and long echo train, which increases sampling efficiency 4 folds. Ongoing comparisons studies with multi-contrast 2DTSE and histopathology will help determine this technique's utility in identifying lipid core and other plaque components.